The release of Colossal Warfare is a week away! New cards are being added to the pool, that will bring a lot of excitement. 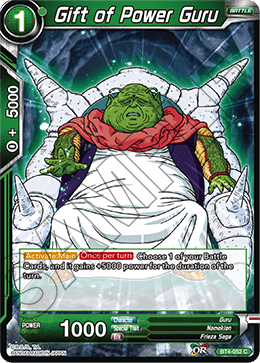 Lets get straight into it and discuss what we at Shenron's Lair think are the Top 5 most usable Green cards! Gift of Power Guru may seem like a small useless card, but he is a low cost investment that may pay off big time. If we were in set 2 format with lots of heavy removal options, Guru wouldn't make our list. However, decks are playing fewer and fewer removal cards and letting 1 drops live longer by saving removal for higher priority targets. Guru gains value over time, simply making all your battle cards have an extra 5k without having to combo a card is great! In the green archtype you can make the Pirina Crit card a 25k instead 20k, or you can overrealm a Masked Saiyan and make it a 25k! Giving your opponent more power to deal with. 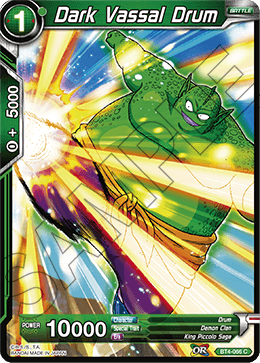 Best part of Guru is that, he is highly splashable in any deck, doesn't require any type of Namekian. As long as Guru survives, he becomes more and more valueable. However he is still weak to removal. The first Piccolo Super Rare is definitely worthy of his status. A 20k Barrier, Double Striker beater, that has an easy Bond condition. 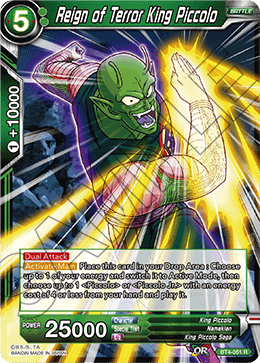 As long as you have another battle card in play Piccolo can KO a battle card every single turn. The condition is very easy to meet, have no battle cards? Overrealm a Time Patrol Trunks, now you have 2 battle cards. 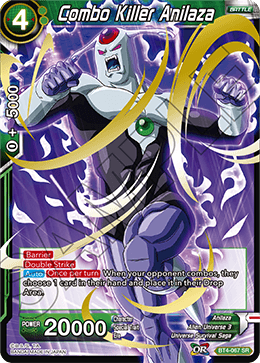 The barrier on this card is also no joke...The only way to remove him is by swinging into it and having a base 20k means a leader swing is not enough and you make your opponent spend a lot of resources. I know what you are thinking...Whaaat? A 5-cost?? In this format?? 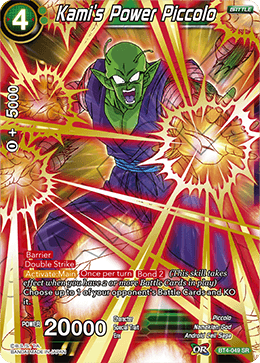 King Piccolo comes into play with 25k Dual attack, which means he matches almost any other 5 drop in power. He is a great tool to get rid of battle cards without having to combo so much. In addition, his effect to discard him and untap 1 energy provides you with a small safety cushion that replaces himself anyway. Using his ability to drop a Kami's Power Piccolo or Dash Pack Piccolo provides even more value when they can also KO a card. In testing, I love this card, and think he has potential to do great things, the only problem is steadily getting to 5 energy. Now I know this guys name, and wow what a beautiful card. Anilaza is one of the few cards that have an impactful effect on both players turns. Once per turn, Whenever the opponent combo's they discard one card...Amazing value, every time you swing into your opponent with your leader, they will have to either take the hit, or combo 1 card to defend and lose 1 card to Anilaza. The 4 energy cost may seem high for a card that doesn't impact the board, but bringing him out first while the board is in control, is a huge advantage to you. Anilaza is a great fit in a deck that can ramp to 4 early. I know we keep saying SSJ3 Leader for all these cards...but that's a debate for a different time. 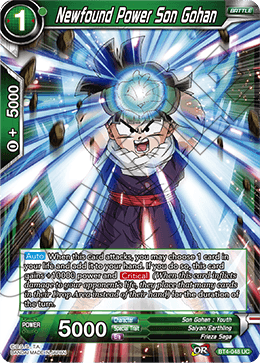 Providing with Critical to not give the opponent 2 cards like Cabba does, and self-awakening is a tool that will help the Green archtype. Also, being a one drop, means he is very splashable and an early game option for many decks. Overall, NewFound Power Gohan will be the most played green card from Colossal Warfare. Just look at this jolly fella.